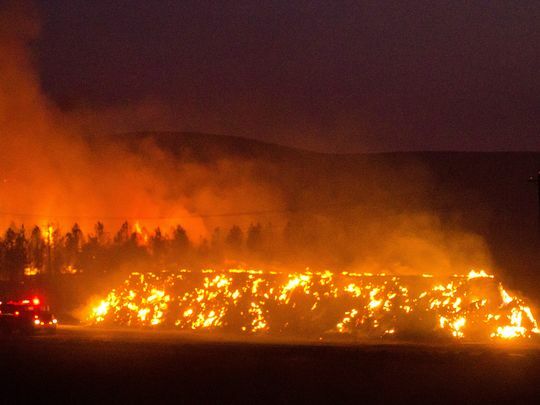 (CBS News) KETCHUM, Idaho – First came the drought, then the summer heat — the perfect formula for wildfires. 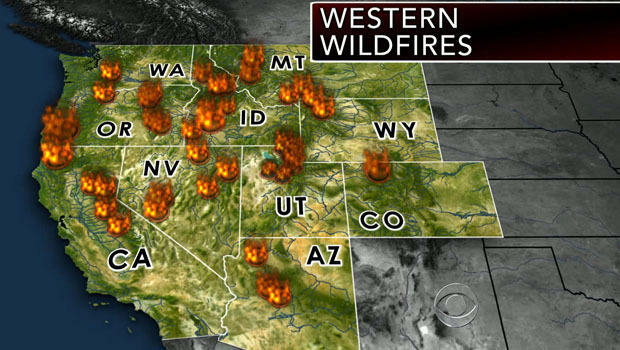 And as of Monday night [Aug.22,2016], there are [were] 49 large fires burning in 11 western states. In the mountains of Utah, smoke still billowed nearly a week after a fire was set off by lightning. The smoke nearly almost blocked the sunrise in Idaho. Thousands have been evacuated and the flames have crept near a prime tourist area… The flames have now burned across more than 100,000 acres in a part of Idaho famous for its scenery and known as a playground for the rich and famous. Fires continue to rage outside Los Angeles, California.